In 2006 the National Science Foundation awarded Major Research Infrastructure (MRI) funding to UNAVCO and the IRIS/PASSCAL seismic consortium for a unique proposal to design and build a reliable power and communication system for autonomous polar station operation. This three-year development effort involves close collaboration with Antarctic seismologists and GPS scientists. Continuous, year-round seismic and geodetic measurements at remote sites will meet longstanding polar and global geoscience goals that have previously been unattainable. Advances made during the first two years contributed greatly to successful deployments in Greenland and Antarctica, including large projects such as POLENET. 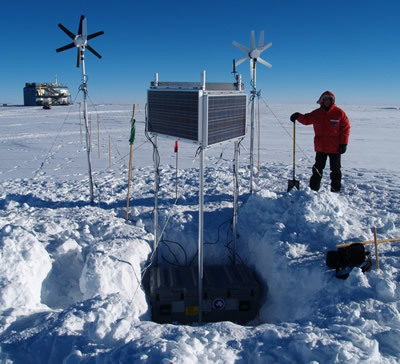 Over 60 GPS and 40 seismic remote permanent stations have been installed, including five GPS and five seismic "science kits" provided under MRI funding to several PI's for installation at diverse Antarctic locations. During the third and final MRI field season, all technical goals were again realized thanks to intense efforts by the field team and the U.S. Antarctic Program support staff. The cold-hardened GPS testbed near South Pole station was upgraded to represent UNAVCO's current best-practice design for year-round operation on the Polar Plateau. To date, system performance is significantly improved over the initial design fielded during the Year 2 field season (Figure 1). The advanced seismic system designed for two-year continuous operation on the Plateau, deployed in 2008 near South Pole Station, was visited and found to be operating normally. The seismic prototype system at Minna Bluff was removed and reinstalled at Fishtail Point, a location of greater scientific interest. The GPS site prototype at Minna Bluff was reconfigured and upgraded. The GPS prototype station at the Miller Range was redesigned and rebuilt to yield better performance at this	extremely windy location (Figure 2). 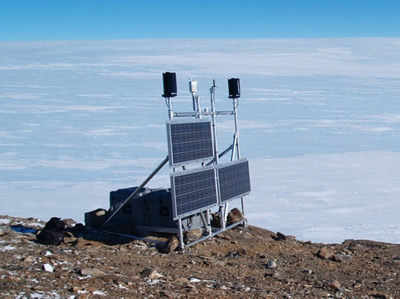 A seismic prototype station was installed on Mount Erebus. Existing GPS and seismic testbeds near McMurdo were upgraded, and four new GPS testbeds were installed. These stations will yield important information regarding wind turbine regulation, communications systems, weather	station performance, lithium battery backup on GPS systems, and a unified GPS/seismic station with shared power and communications systems (Figure 3). Figure 1 - GPS Plateau Testbed at South Pole Station. This system incorporates more efficient insulation, superior wind turbines, and improved thermal management. 16 channels of engineering data are being recorded here through winter 2009, including a side-by-side test of two wind modified turbines. Figure 2 - GPS prototype station at Iggy Ridge in the Miller Range. This site, at the edge of the Polar Plateau at 84 degrees south experiences severe cold and extreme winds, and is a proving ground for wind turbine technology, structural designs, and thermal management. 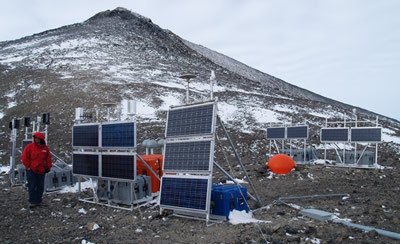 Figure 3 - Five GPS and one GPS/seismic testbed stations installed near McMurdo Station represent a facility for proving advanced technologies under true polar conditions.